This is an epic baseball card. It was huge back in 1987, and unlike most of the junk wax era, I dare say this card has aged well. Before we delve into Naming the Game, let’s dissect this card. It is obviously a play at home given that the Expos catcher Mike Fitzgerald is in the frame. What else do we see? 1. Catcher’s mask in the foreground. 2. Fitzgerald with his head turned looking for a passed ball. 3. 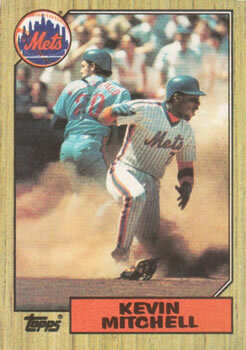 Kevin Mitchell rising like a Phoenix out of a swirling, cloud of dust. 4. Mitchell’s blue batting gloves, orange wristbands and orange undershirt. 5. Kevin’s huge pack of chaw and accompanying “woooooo” look. 6. The crowd is on their feet! 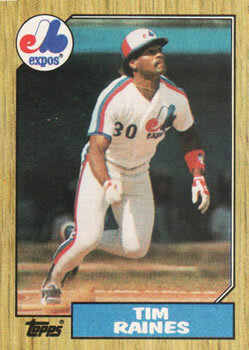 In 1986, Kevin Mitchell played in six home games against The ‘Spos in 1986. A three game set in late June and a three game set at the beginning of August. Of those games, Fitzgerald appeared in four, the entire June series and the first game of the August series. Three of those four games were at night, so, easily enough, we are left with the June 25, 1986 game as the one shown on the card. Let’s try and figure out what play this is! In this game, Mitchell was 3 for 4, but only made it to home plate in the Bottom of the 4th. To get on base, Mitchell lined a double to left field off of Andy McGaffigan, scoring Daryl Strawberry. The next batter, Ray Knight, singled to Tim Raines in left, who then tried to nab Mitchell at home. 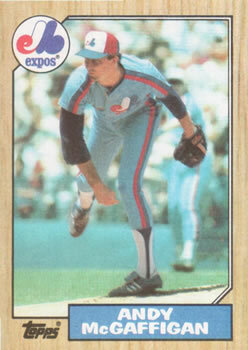 The throw made it passed Fitzgerald, allowing Knight to advance…The Mets went on to beat the Expos 5 to 2. So, the play depicted on this card was during a June 25th 1986 day game at Shea Stadium between the New York Mets and Montreal Expos. Specifically, the play at the plate was in the bottom of the fourth inning. 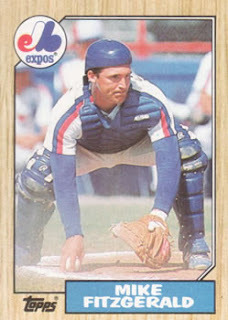 Quick Fact – Mike Fitzgerald began his career as a catcher for the New York Mets and was latter part of a trade that brought Gary Carter from the Expos to the Mets in December of 1984.